Soils of the Lake Duparquet Forest have evolved on quaternary deposits such as tills, glaciofluvial sands and gravely sands, and glaciolacustrine clays, silts and sands left by post-glacial Lake Barlow-Ojibway. On slopes and crests, surficial deposits are thinner and rock outcrops are common. Common mineral soils are humo-ferric Podzols, distric Brunisols, gray Luvisols and Gleysols. Organic soils are found in depressions and poorly drained lowlands. Clayey soils are the most extensive and represent a distinctive characteristics of the region. The gentle topography favors rapid drainage of surface water and moisture regime varies from moderately dry to very moist depending on position on slope and slope form (Brais and Camiré, 1992). High base cation content and well-structured surficial mineral horizons account for the high productivity of these soils (Bergeron et al., 1982; Paré and Bergeron, 1995 ; Brais and Camiré, 1998). On the other hand, clayey sites represent a major challenge for silviculturists. When moist, they are highly susceptible to rutting and logging traffic can destroy the structure of surface mineral horizons (Brais and Camiré, 1998). As well, scarification of the forest floor can increase frost heaving of planted seedlings. Following harvesting or site preparation recolonization by shrubs and grasses may also out-compete natural or artificial regeneration (Harvey and Bergeron, 1989; Harvey et al., 1995; Durand et al., 1988). 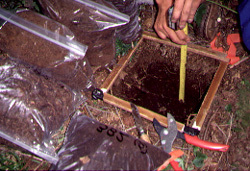 Research on soils in the Lake Duparquet Forest and in the region has focused on nutrient cycling following natural disturbances (Brais et al., 1995; Paré et al., 1993) and on impacts of forest harvesting and site preparation on nutrient cycling and soil physical characteristics (Brais et al., 1995; Brais and Camiré, 1998).